Rheumatoid arthritis is a multisystemic auto-inflammatory disease affecting up to 1% of the population and leading to the destruction of the joints. Evidence exists for the involvement of the innate as well as the adaptive immune systems in the pathology of the disease. The success of anti-tumour necrosis factor-α indicates the importance of pro-inflammatory mediators produced by innate immune cells in rheumatoid arthritis progression. Therefore, considerable efforts have been made in elucidating the signalling pathways leading to the expression of those mediators. This review will concentrate on the role of signalling pathways in innate immune cells in the context of rheumatoid arthritis. The immune system evolved as a mechanism to protect organisms from infection by pathogenic organisms and other harmful substances. In general, the immune system is capable of recognising invading pathogens and their products as well as endogenous danger signals . This recognition results in the initiation of an immune response, which will under normal circumstances eliminate the insult without further damage to the host. However, it is now well recognised that defects in regulating inflammation can lead to an excessive response to infectious agents, such as sepsis, or auto-inflammatory diseases, such as rheumatoid arthritis (RA). In the context of RA numerous cellular mechanisms and signalling pathways drive the chronic inflammation observed in this disease, and current evidence suggests an involvement of the innate as well as the adaptive immune systems in RA pathology. The importance of the adaptive immune response is supported by rodent models of disease, such as collagen-induced arthritis (CIA), that are mainly Th1- and/or Th17-driven . Mice lacking IL-23 do not develop CIA  and CCR6-expressing Th17 cells are preferentially recruited to inflamed joints . In humans, the efficacy of anti-CD20 (Rituximab) and anti-CTLA4 (Abatacept) antibodies in RA treatment suggest a function for activated B and T cells in RA [5, 6]. Moreover, a role for CD4+ T cells in RA pathogenesis is inferred by the strong HLA-DR association . During the progression of RA the production of cytokines, chemokines and matrix metalloproteinases by mainly innate immune cells leads to the destruction of cartilage and bone. Currently, the most successful RA therapeutics are the biologicals Infliximab, Etanercept and Adalimumab , which block tumour necrosis factor (TNF)α, a cytokine produced mainly by macrophages . The importance of TNFα in disease pathogenesis has also been shown in murine models of the disease [10, 11]. Given the success of anti-TNFα therapy, there has been a great deal of interest in elucidating the pathways driving the production of this cytokine as well as other inflammatory mediators in RA. Other innate immune cells that may have a role in RA include neutrophils , mast cells  and natural killer cells . They have been shown to be present in high numbers and widely distributed in synovial fluid and tissues. These cells are able to produce several cytokines that may be involved in the pathogenesis of disease, but their contribution to pathogenesis is poorly understood. This review will describe inflammatory signalling mechanisms in innate immune cells, and concentrate on the emerging evidence implicating certain signalling pathways in driving the continuous production of pro-inflammatory mediators in the RA joint. The main role of toll-like receptors (TLRs) is considered to be the recognition and response to microbial pathogens, but they have also been reported to recognise endogenous ligands (reviewed in [15–20]). Endogenous ligands are thought to be released during necrotic cell death induced by tissue damage, stress factors or infection, resulting in the release of cell components that initiate an inflammatory response . The contents released from necrotic cells may activate TLRs, generating further inflammation and thus more necrosis. This cycle of inflammation may explain the chronic inflammatory state found in autoimmune diseases such as RA. Indeed, endogenous TLR ligands, such as hyaluronan oligosaccharides, fibronectin fragments, heat shock proteins, antibody-DNA complexes and high mobility group box (HMGB)-1, have all been identified in the RA joint [22–25] and several studies emphasise a role for TLRs in the promotion of systemic lupus erythematosus, asthma, Crohn's disease, multiple sclerosis, type 1 diabetes, and RA . Given the existing evidence of an involvement of TLRs in the pathogenesis of RA and other inflammatory diseases, a great deal of interest exists in understanding the molecular basis of the signalling pathways induced by these receptors, with the hope of identifying therapeutic targets. Due to their structural similarities TLRs share certain signalling pathways with the IL-1R family . TLR and IL-1R signalling is initiated by ligand-induced hetero- or homodimerisation of the receptors or association with accessory proteins . The signal is transduced by the intracellular Toll/IL-1 receptor (TIR) domain, present in TLRs as well as IL-1Rs, through the recruitment of TIR domain-containing adaptor molecules . The TLRs use distinct combinations of these adaptors to turn on the common TLR/IL-1R pathway as well as pathways unique to TLRs, leading to the activation of transcription factors (Figure 1). TLR signalling pathways. For simplicity reasons the signalling pathways induced by toll-like receptor (TLR)4, which utilises all four known adaptor proteins, is shown. Following stimulation and dimerisation, the IL-1R and TLR signalling pathways, with the exception of TLR3, recruit the adaptor molecule MyD88 and induce nuclear factor (NF)-κB and mitogen-activated protein kinases (MAPKs) through IL-1R associated kinase (IRAK)-4, IRAK-1 and TNF receptor associated factor (TRAF)-6. In addition, a MyD88-independent signalling pathway is utilised by TLR3 and TLR4, which depends on the adaptor molecule TRIF (TIR-domain-containing adapter-inducing interferon-β) and leads to the induction of interferon regulatory factors (IRFs) and a late activation of NF-κB. Signalling through TLR4 results in phosphoprylation and activation of protein tyrosine kinases (TKs). The Tec family member Btk interacts with the Toll/IL-1 receptor (TIR) domains of TLRs, MyD88 and Mal (MyD88 adaptor like protein). Once activated, Btk phoshporylates Mal and activates NF-κB and/or p38 MAPK. Src family kinases (SFKs; for example, Hck) are known to function upstream of both Pyk2 and Syk kinases, respectively, in TLR signalling. TLRs mediate phosphatidylinositol-3-kinase (PI3K) activation that suppresses p38 MAPK and NF-κB. Inhibition of these signalling cascades by PI3K is possibly mediated by protein kinase B (PKB), and limits the production of inflammatory cytokines. IKK = IkappaB kinase; RANTES, Regulated on activation, normal T expressed and secreted; TBK, TANK-binding kinase; TNF, tumour necrosis factor; TRAM, TRIF-related adaptor molecule. IL-1Rs and all TLRs, with the exception of TLR3, share a common signalling pathway that depends on the adaptor molecule MyD88 (Myeloid differentiation primary response gene 88) [28–31]. It has originally been identified as a protein induced during myeloid differentiation  but has since been shown to be recruited to IL-1Rs and most TLRs through its carboxyl terminal TIR domain [28, 30]. In addition, MyD88 contains an amino-terminal death domain that is responsible for the recruitment of downstream signalling mediators, including IL-1R associated kinase (IRAK)-1, IRAK4 and TNF receptor associated factor (TRAF)6 to the receptor complex [28, 30]. 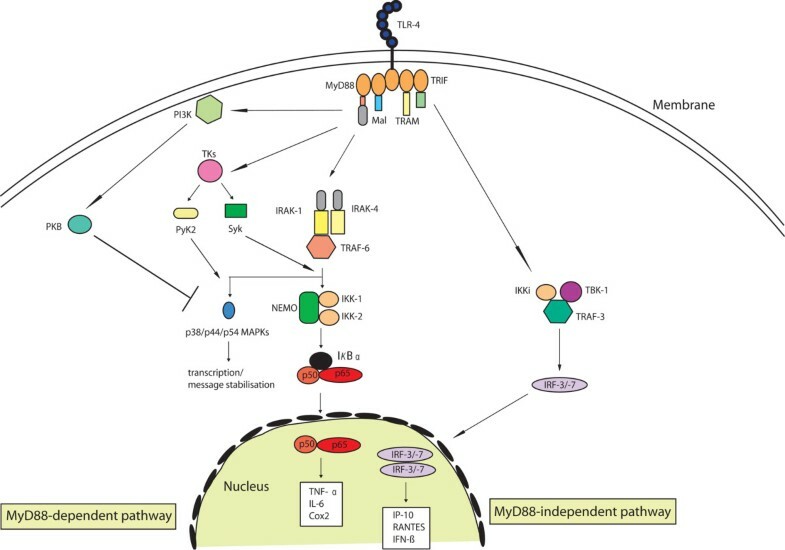 Ultimately, this leads to the activation of mitogen-activated protein kinases (MAPKs) as well as nuclear factor (NF)-κB and the transcription of inflammatory mediators such as TNFα  and the stabilisation of inflammatory response protein mRNAs through the AU-rich elements in the 3' untranslated region . The essential role of MyD88 in IL-1R/TLR signal transduction has been demonstrated in MyD88-deficient mice. In response to IL-1R and IL-18R stimulation, MyD88-deficient macrophages show a loss in NF-κB and MAPK activation, as well as TNFα and IL-6 production . This has also been observed for most TLRs, with the exception of TLR3 and TLR4 [34–37]; TLR3 does not utilise MyD88 for signal transduction while TLR4 recruits additional adaptor molecules that are responsible for MyD88 independent signalling. Subsequently, TIR domain homology searches led to the discovery of Mal (MyD88 adaptor like protein; also termed TIRAP [38, 39]). Mal-deficient mice show a reduction in TLR4- and TLR2-induced NF-κB activation [40, 41]. To date, Mal is thought to function as a sorting adaptor for TLR2 and TLR4, recruiting MyD88 to the receptor complex in the plasma membrane, through its ability to interact with phosphatidylinositol-4,5-bisphosphate  (Figure 1). Evidence obtained in murine and human models indicate the involvement of the MyD88-dependent signalling pathway in the pathology of RA. TLR2 knockout and MyD88 knockout mice are protected from streptococcal cell wall-induced joint inflammation since these animals do not develop joint swelling [43, 44]. Furthermore, intra-articular administration of peptidoglycan or lipopolysaccharide, the ligands for TLR2 and TLR4, respectively, results in destructive arthritis in mice, which is also dependent on MyD88 [45, 46]. The IL-1R antagonist (IL-1RA) knockout mice model displays uncontrolled IL-1 signalling and leads to the development of chronic arthritis . The arthritis observed in those mice is markedly reduced when backcrossed to TLR4-deficient but not TLR2-deficient mice, suggesting a TLR4-specific function in this model . Furthermore, blocking TLR4 signalling with a naturally occurring antagonist in mice with CIA leads to reduced disease severity, even when administered after disease onset . In humans, stimulation of TLR2- and TLR9-expressing RA synovial fibroblasts with peptidoglycan leads to the expression of matrix metalloproteinases and secretion of IL-6 and IL-8, while no activation has been observed in response to the TLR9 ligand CpG oligodeoxynucleotides . Strengthening the role of TLR4 signalling in RA pathogenesis is the observation that serum and synovial fluid from RA patients stimulated TLR4 expressing CHO cells to up-regulate CD25 . In accordance with this study are results obtained in RA synovial membrane cultures, where the over-expression of a dominant negative construct of MyD88 or Mal inhibits the spontaneous release of cytokines and matrix metalloproteinases [52, 53]. Based on these results, increased efforts have been made to identify potential endogenous TLR ligands in the joints of RA patients. Indeed, it has been shown that conditioned medium from RA synovial membrane cultures activates human macrophages in a MyD88- and Mal-dependent manner, further strengthening the involvement of an endogenous TLR ligand driving RA pathology [52, 53]. In addition to endogenous TLR ligands, exogenous ligands derived from infections might potentially also play a role in RA, although no ligand has so far been defined. In addition to the MyD88-dependent TLR signalling pathway, which is shared with the IL-1Rs, TLRs also induce MyD88 independent signalling cascades. Stimulation of cells with double-stranded RNA or lipopolysaccharide (TLR3- and TLR4-ligands, respectively) results in the activation of interferon regulatory factors (IRFs). This is due to the presence of additional TLR adaptor molecules, which have been identified through TIR domain homology searches and include: TRIF (TIR-domain-containing adapter-inducing IFN-β; also termed TICAM-1), TRAM (TRIF-related adaptor molecule; also termed TICAM2) and SARM (TIR domain-sterile alpha and HEAT/Armadillo motif) . Stimulation of TLR3 or TLR4 results in the recruitment of TRIF, and in the case of TLR4 also TRAM [55–57]. The dissociation of TRIF activates a complex consisting of the kinases IkappaB kinase (IKK)i and TANK-binding kinase (TBK)-1 as well as the scaffolding protein TRAF3 , which ultimately leads to the activation of IRF-3 and IRF-7 and the expression of IFN-inducible genes such as those encoding IFN-β, IP10 (inducible protein 10) and RANTES (Regulated on activation, normal T expressed and secreted) [26, 59, 60]. Moreover, TRIF recruitment has also been shown to be responsible for MyD88-independent activation of NF-κB. However, the exact mechanism of NF-κB activation by TRIF is still unclear. Some find that binding of receptor interacting protein (RIP)-1 to the RIHM (RIP interacting homology motif) domain of TRIF leads to the induction of NF-κB, while others suggest that an autocrine effect of TNFα, initially induced through IRF-3, is responsible for NF-κB activation [61, 62]. TRAM is structurally related to Mal and has therefore been suggested to function as a sorting adaptor, recruiting TRIF to TLR4 [42, 56]. In this context, TRAM has been shown to be recruited to the plasma membrane by myristoylation . However, a recent study provides evidence that TRAM recruitment is subsequent to the endocytosis of the TLR4 complex . Therefore, TRAM provides a mechanism that allows sequential activation of MyD88-dependent signalling while TLR4 is located in the plasma membrane, followed by TRIF-dependent signalling after TLR4 internalisation  (Figure 1). SARM is the least investigated TLR adaptor molecule. So far, no activation function could be assigned to it. However, recent data describe SARM as an inhibitor of TRIF-dependent signalling . SARM has been shown to interact with TRIF and expression of SARM in HEK293 cells led to the inhibition of TRIF-dependent, but not MyD88-dependent, NF-κB activation . Some evidence indicates the involvement of the TRIF-dependent signalling pathway in the pathology of RA due to TLR3 stimulation. RNA released from necrotic synovial fluid cells has been shown to activate RA synovial fibroblasts via TLR3 . Interestingly, RA synovial fibroblasts have been shown to respond to the TLR3 stimulation by producing TNFα while primary human skin fibroblasts do not . This shows that TLR3 is functional in the inflamed synovium and that TLR3 stimulation could potentially result in the production of TNFα in the RA joint. Up until now the focus of TLR signalling research has been on delineating the membrane-proximal adaptor molecules utilised. But determining the downstream pathways engaged is important in understanding TLR specificity, as well as providing therapeutic targets. The involvement of protein tyrosine kinases (TKs) in TLR signalling was appreciated even before the TLRs themselves were discovered , but with dozens of TKs found in mammalian cells the identities of the molecules involved in TLR signalling have only been revealed recently . There is good evidence to suggest that Hck [70, 71], Btk [72–75], Bmx [76, 77], Syk [78, 79] and Pyk2 [80–82] are involved in TLR signalling, even though the evidence can be hard to come by due to extensive redundancies found in TKs (Figure 1). The mechanisms by which these kinases operate in TLR signalling pathways still need to be resolved. Concomitantly, a number of TKs have been implicated in the negative regulation of TLR signalling. For example, members of the TAM receptor family inhibit both MyD88 and TRIF pathways by induction of suppressor of cytokine signalling (SOCS)-1 and -3 [83–85]. In light of these links between TKs and TLR signalling, the recently discovered TK inhibitors such as Dasatinib may potentially be useful in blocking harmful effects of TLR signalling in chronic inflammation . Phosphatidylinositol-3-kinases (PI3Ks) belong to a large family of lipid signalling kinases that phosphorylate phosphoinositides and control numerous cellular functions, such as proliferation, survival and migration . They consist of a catalytic 110 kDa subunit and a tightly associated 85 kDa regulatory subunit. PI3Ks become activated in response to numerous TLR stimuli, including lipopolysaccharide, peptido-glycan and CpG-DNA, and subsequently induce the phos-phorylation of Akt/protein kinas B [88, 89]. Current data suggest that the activation of PI3Ks, following TLR stimulation, leads to the inhibition of MAPKs and NF-κB as observed using chemical inhibitors or over-expression systems  (Figure 1). In the context of RA it is interesting to note that p110γ-knockout mice are resistant to models of RA and that the administration of PI3Kγ inhibitors restrain the progression of inflammation and joint damage . However, the reduced incidence and severity of RA observed in PI3K-knockout mice is most likely due to its role in the T- and B-cell compartment rather than in innate immune cells . It is likely that several TLRs are stimulated in the RA joint due to the release of numerous 'danger signals' following cell necrosis. The induction of TLR signalling pathways would subsequently lead to the expression of pro-inflammatory mediators, including cytokines and chemokines. These mediators, discussed in the next section, are able to feedback upon the macrophage to form an autocrine inflammatory loop, potentiating disease. Several cytokines have a direct effect on monocytes/macrophages in the context of RA (Table 1) and exert pathological effects during disease progression. One such example is IL-15, which exhibits pro-inflammatory activity both in vitro and in CIA, and when blocked will reduce the incidence of disease . However, this review focuses on six of those cytokines for which involvement in RA is well characterised: TNFα, IL-1, IL-10, macrophage migration inhibitory factor (MIF), IL-17, and receptor activator for NF-κB (RANK). Up and down arrows indicate increase and decrease, respectively. FcγRs, Fcγ receptors; iNOS, inducible nitric oxide synthase; MHC, major histocompatibility complex; MIF, macrophage migration-inhibitory factor; NO, nitric oxide; PG, prostaglandin; ROI, reactive oxygen intermediates; TGF, transforming growth factor; TNF, tumour necrosis factor. Adapted from . The IL-1 family of cytokines plays a significant role in RA and includes IL-1α, IL-1β, IL-1RA, IL-18, IL-33, and IL-1F5, 6, 7, 8, 9 and 10. IL-1β is a potent pro-inflammatory cytokine with roles in bone erosion and cartilage degradation, rather than in synovitis. In a streptococcal cell wall-induced arthritis model, IL-1-/- mice showed reduced late cellular infiltration and cartilage damage while joint swelling is unaffected . Also, by crossing IL-1-/- mice with the TNFα-transgenic model of arthritis, Zwerina and colleagues  showed that IL-1 is essential for TNFα-mediated cartilage damage and has a partial role in TNFα-mediated bone damage. IL-1β is able to activate macrophages to induce the production of cytokines, reactive oxygen intermediates and prostaglandin (Table 1). Signalling is mediated through the dimerisation of two receptors, IL-1RI and IL-1R-AcP. A third receptor, IL-1RII, can also bind IL-1β but cannot mediate signalling due to a small cytoplasmic tail and acts as a decoy . IL-1RA can also bind these receptors and acts as a competitive inhibitor. In the case of RA, IL-1β is more plentiful than IL-1RA, inducing a pro-inflammatory state . The intracellular signalling cascade of IL-1 is similar to that of the MyD88-dependant TLR cascade discussed previously and involves the induction of IRAK1, IRAK4, MyD88 and transforming growth factor-activated kinase (TAK)1 . NF-κB mediates multiple gene transcription events, and in the context of IL-1β is able to activate another transcription factor, ESE-1, which modulates several pro-inflammatory genes . TNFα is considered to be the principal inflammatory cytokine in RA and is the major factor involved in inducing and maintaining synovitis. It is commonly found at high levels in RA patients and, as such, has been targeted successfully to alleviate disease symptoms. TNFα is a cytokine that both activates and can be produced by macrophages and therefore forms an autocrine inflammatory effect. As well as its well-documented effects (Figure 1), TNFα has been shown to affect both major histocompatibility complex and Fcγ receptor (FcγR) expression. TNFα is able to reduce the expression of HLA-DR on myeloid RA cells where this is brought back to normal upon the addition of anti-TNFα. TNF treatment of healthy monocytes also reduced HLA-DR and a mixed lymphocyte reaction . TNFα is able to reduce the expression of all activating FcγRs in vitro where anti-TNFα can increase FcγRIIa and IIIa. However, in RA patients, anti-TNFα therapy is accompanied by an initial reduction in FcγRI but increases back to normal after therapy is finished . Intra-cellular signalling is mediated through TNF-R1 and TNF-R2, which upon binding of TNFα will recruit several signalling molecules . TRAF2 is recruited to the receptor and in conjunction with TAK1 is able to activate a signalling cascade resulting in JNK and c-Jun activation. RIP is recruited to this receptor complex, which in turn can activate the IKK signalosome to activate NF-κB. IKK2 and the p50 subunit of NF-κB have been shown to be essential for this process, while IKK1 is not [99, 100]. TRADD (TNFR-associated via death domain) and FADD (Fas-associated protein with death domain) are also recruited to the receptor signalling complex to induce apoptosis. NF-κB inducing kinase is another TNF receptor-associated factor described in TNFα induction, but has proven to be non-essential . Zwerina and colleagues  recently showed that p38 MAPK was essential for TNFα-mediated bone degradation through affecting osteo-clast differentiation, but did not specify if this involves the activation of macrophages. MIF is able to activate and recruit macrophages during RA. It is the essential factor in RA fibroblast-conditioned medium for TNFα induction in monocytes . This is mediated through CD74, the subsequent engagement of p38 MAPK, ERK, Src kinase, phospholipase A2 and PI3K pathways [104–108], and the binding of NF-κB and AP-1 to DNA to effect gene transcription . MIF has been shown to be an endogenous antagonist of glucocorticoids (reviewed in [110, 111]); by inhibiting the latter, MIF enhances the inflammatory state through p38 MAPK and MAPK phosphatase 1 (MKP1) , which in turn deactivates p38, JNK and ERK. MKP1-deficiency has been associated with exacerbation of CIA , potentially by affecting MIF signalling. MIF is also able to negatively regulate p53  through cyclooxygenase 2  and the PI3K/Akt pathway  to arrest cell-apoptosis. Finally, MIF recruits monocytes/macrophages to the site of inflammation through CCL2 induction , or acting as a chemokine ligand on endothelial cell surfaces by directly binding to CXCR2 . IL-10: anti- or pro-inflammatory in rheumatoid arthritis? IL-10 is widely considered to be a powerful anti-inflammatory cytokine that is able to suppress the production of TNFα, IL-6 and IL-1 from macrophages. Its role in RA disease-associated macrophages, however, is controversial. Human IL-10 has little effect when used to alleviate disease in RA patients. On the contrary, circulating monocytes have been shown to upregulate the expression of FcγRI and FcγRIIa in response of IL-10 [119, 120], which may potentially enhance disease. IL-10 has also been shown to upregulate various genes associated with pro-inflammatory function, as well as the IFN-γ-inducible genes . In response to IL-10, RA macrophages upregulate TNF receptor (TNFR)1 and TNFR2 mRNA and produce elevated levels of IL-1β and IL-6 in response to TNFα and macrophage-colony stimulating factor . However, others suggest that IL-10 upregulates the soluble form of the TNFR rather than the membrane bound form, which in turn would inhibit inflammation . To confound the matter further, it has been shown repeatedly that in whole RA synovial cultures the addition of IL-10 suppresses the level of TNFα and IL-1β two- to three-fold  (reviewed in ), in sharp contrast to the RA macrophage phenotype. IL-10 treatment of CIA mice has also been shown to inhibit disease progression . Overall, this suggests that arthritic macrophages may have altered signalling patterns when compared to other cell types, and IL-10 may have both anti- and pro-inflammatory functions in RA. In macrophages the principal intracellular mediator of suppressive effects of IL-10 is STAT3 . IL-10 binds to the IL-10R1/IL-10R2 receptor complex and recruits both Jak1 and Tyk2 to activate STAT3 . The tyrosine residues contained within the YXXQ-STAT3-docking site on IL-10R1 were found to be essential for this interaction . The mechanism of IL-10 suppressive activity is unclear . IL-10 has been reported to reduce the activity of the IKK signalosome and induce the translocation of NF-κB p50:p50 homodimers, resulting in a suppression of NF-κB-mediated gene transcription . However, our own studies have found no effect on the activation of NF-κB [125, 130]. It should also be noted that IL-10 is able to strongly induce the expression of SOCS-3, a classic suppressor of cytokine signalling . However, the role for SOCS-3 in mediating the effect of IL-10 is undetermined as the cytokine is still functional in SOCS-3-/- mice . CD4+ helper T cells that secrete IL-17 are at the centre of an orchestra of cellular interactions that mediate acute inflammation in many autoimmune diseases. This has renewed the interest in understanding signalling by the IL-17 receptor, which is found in macrophages  and synovial fibroblasts . As with other cytokines, the IL-17 receptor is a complex of at least two separate proteins, IL-17RA and IL-17RC . These, together with IL-17RB, RD and RE, form a distinct receptor superfamily with little similarity to other cytokine receptors. Likewise, there are no fewer than six members in the IL-17 cytokine family (reviewed in ). Two of them, IL-17A and IL-17F, are secreted by Th17 cells. A third one, IL-17E or IL-25, is associated with Th2 responses. The functions of the other family members are unknown at the moment. It has been suggested that the IL-17 receptor chains are pre-assembled before ligand binding , but the details are murky. So are the intracellular signalling pathways utilized by IL-17R. IL-17RA has a long cytoplasmic tail, but factors that engage this tail are unknown, with the exception of TRAF6, which is needed for IL-17 signalling . But as IL-17RA has little similarity to the TNF receptor superfamily, the structural basis of this interaction is unclear at this stage. Activation of NF-κB and MAPK pathways lead to transcription and mRNA stabilisation of pro-inflammatory molecules; transcription factors such as AP-1 and c/EPB are also important in mediating the full activities of IL-17 (reviewed in ). Bone destruction in arthritic conditions can be directly attributed to osteoclasts, a specialised lineage of macrophages involved in normal bone development and remodelling. In RA they are found to be overactive, and this can largely be attributed to the pro-inflammatory milieu found in RA joints, which includes excessive RANK ligand (RANKL)-RANK signalling. RANKL is a member of the TNF superfamily and, correspondingly, RANK belongs to the TNFR superfamily. The discovery that RANKL-RANK signalling is the key molecular event in osteoclast differentiation by several independent groups in the late 1990s [139–142] gave birth to the field of osteoimmunology. RANKL is normally expressed in osteoblasts and stromal cells, but in pro-inflammatory environments, as in RA, RANKL expression is elevated and spreads, particularly to activated T cells [139, 143, 144]. This increases the maturation and activity of osteoclasts, thus tipping the bone metabolic balance in favour of destruction. A further level of regulation is provided by osteoprotegerin, which acts as a soluble decoy receptor of RANKL, and thus is an effective inhibitor of RANK signalling and osteoclast differentiation [145, 146]. Given the importance of bone destruction as a cause of morbidity in RA, the RANK-RANKL-osteoprotegerin triad is now a target for therapeutic intervention. Characterisation of the signalling pathways utilised by RANKL-RANK is aided by their similarities to other TNF superfamily members. In essence, RANK and RANKL are trimeric molecules; upon ligand binding multiple TRAFs are recruited, with TRAF6 being the critical adaptor as its absence incapacitates osteoclasts [147, 148]. TRAF6, together with Gab2 , triggers NF-kB, Akt and Jnk pathways. Ultimately, expression of osteoclastogenic genes is switched on by a cascade of transcription factors that include NF-κB, NFATc1, c-Fos [150, 151] and osterix . The role of T cells in RA pathogenesis has been questioned by some, but as cited earlier it is now accepted that autoreactive T cell activation is essential in the development of the full blown disease both in human and animal models. However, it is unclear what the relative contributions from T cell-derived versus TLR- or cytokine-derived signals are. Perhaps T cells prime the initial inflammation; once tissue damage is occurring other signals take over in the maintenance and amplification of inflammation at disease sites. The signals innate immune cells receive from arthritogenic T cells are still being worked out. Some of the soluble factors, such as IL-17 and RANK, have already been covered, but they clearly are not the whole story. For example, RA T cells have been shown to induce TNFα production in monocytes in a direct cell-contact, PI3K-dependent manner [153–155]. Separately, but perhaps in a related finding, it was found that T cells generate microparticles that can promote cytokine production in macrophages . The molecular basis of these phenomena is still being worked out; molecules such as CD40L and membrane bound-TNFα have been implicated [157, 158]. Modelling this interaction in vitro is difficult as the outcome is highly dependent on the status of both T cells and macrophages [155, 158]. It is likely that in vivo studies will be needed to resolve this question. RA is an auto-inflammatory disease where multiple mechanisms of the immune system play a role in its pathology. Current evidence in human suggests a strong influence of innate immune cells, such as macrophages and synovial fibroblasts, in the progression of disease, as they produce large amounts of pro-inflammatory mediators leading to the destruction of the cartilage and bone. Given the success of anti-TNFα therapy, there has been a great deal of interest in elucidating the pathways driving the production of this cytokine as well as other inflammatory mediators in RA. However, the continuous and systemic blockade of a cytokine results in unwanted side effects, such as increased infections. Current research on a new generation of anti-inflammatory drugs has focused on blocking intracellular signalling pathways, for example, NF-κB/IKK2 and p38 MAPK. However, no compounds have succeeded in the clinic so far. A major problem could be that both these kinases are ubiquitously expressed, which may lead to side effects. Therefore, there is a need for more specific targets that would either affect specific parts of the immune response, act only in specific tissues/cells or would actually lead to the complete resolution of the chronic inflammation. The use of specific blocking antibodies as well as emerging technologies such as small interfering RNA will expand our knowledge on particular signalling transducers in the context of the disease. Therefore, further elucidation of the signalling pathways driving chronic inflammation in disease-relevant models could potentially lead to the identification of therapeutic targets. The authors thank Dr Lynn Williams for critical reading of the manuscript. The authors' work is generously supported by the Arthritis Research Campaign, Trustees of the Kennedy Institute of Rheumatology and the National Institutes of Health.